Ground Source Heat Pumps are stand-alone units. They are roughly the same size as a fridge freezer unit. They can be installed outside or inside your home or business premises. Groundworks are required to lay the ‘ground-loop’ system. This is the pipework that collects the heat energy from the ground. The great news is that they can save up to 80% of your energy consumption! Ground Source Heat Pumps work by drawing in heat from the ground. It then transfers heat to provide you with your heating needs. It distributes via underfloor heating and radiators. When outside temperatures are below zero, 100% of your heating and hot water needs can still be generated. This is because the ground temperature is generally between 6 – 12 degrees all year round. The ground loop can sit horizontally or vertically. If horizontally laid, the loops need to be a meter below the surface. If vertically laid, a bore is drilled around 100 meters down. If you have a lake, they work very well as this temperature is also consistent. The most common configuration is horizontal ground loop. This loop is laid in a straight line, spaced at least 1 meter apart. A good deal of land is needed for the heat pump groundwork. A good rule of thumb being 3 times the amount of floor space you are looking to heat. Many heat pumps qualify for the Renewable Heat Incentive scheme, which offers money for simply installing and using renewable energy products. 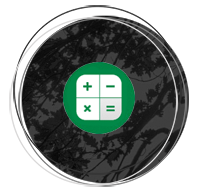 The Green Square range offers NIBE ground source heat pumps, as well as DIMPLEX Ground source heat pump product ranges. Covering various sizes and needs for properties and businesses. Ground Source Heat Pumps are extremely efficient because they move energy rather than create it. They are seen as a long-term renewable energy investment, as the benefits continue over time, often with added profits. For every 3kW of heat moved into your home it only uses 1kW of electricity. • The ground-loop pushes fluid around its circuit collecting the heat from the soil. • The heat pump’s evaporator then uses the ground source heat obtained by the exchanger to boil the refrigerant. This boils at approximately -10˚C. Then it turns the refrigerant into vapour, which is then transferred to the Compressor. • The Compressor then compresses the vapour and as its volume decreases. At the same time its temperature increases. The gas that is created is fed through to a heat exchanger within the heating pump. • Forcing the hot gas through the central heating system’s cold water condenses the refrigerant back into a liquid. As it does this, its heat is passed into the heat exchanger, which supplies your domestic hot water. Then it powers the central heating system using the air source heat extracted at the source. • To complete the heat pump’s closed circuit, the pressure of the condensed liquid is reduced via the expansion valve. The end result is just as planned - your heating requirements are fulfilled! 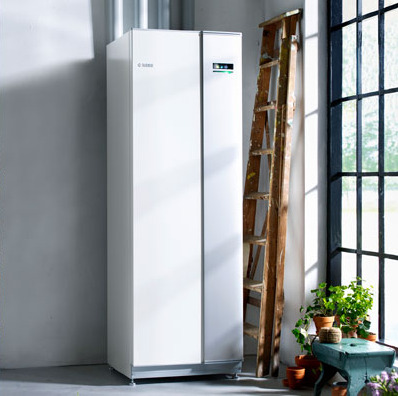 Green Square offers the NIBE ground source heat pumps range, which is one of Europe’s leading manufacturers. Also available from Green Square DIMPLEX single phase ground source heat pump range. Please click below to find out more information about the ranges and specific models available.